Microchip Technology Inc today announced from EE Live! and the Embedded Systems Conference in San Jose the PIC16(L)F170X and PIC16(L)F171X family of 8-bit microcontrollers (MCUs), which combine a rich set of intelligent analog and core independent peripherals, along with cost-effective pricing and eXtreme Low Power (XLP) technology. Available in 14-, 20-, 28-, and 40/44-pin packages, the 11-member PIC16F170X/171X family of MCUs integrates two Op Amps to drive analog control loops, sensor amplification and basic signal conditioning, while reducing system cost and board space. These new devices also offer built-in Zero Cross Detect (ZCD) to simplify TRIAC control and minimize the EMI caused by switching transients. Additionally, these are the first PIC16 MCUs with Peripheral Pin Select, a pin-mapping feature that gives designers the flexibility to designate the pinout of many peripheral functions. 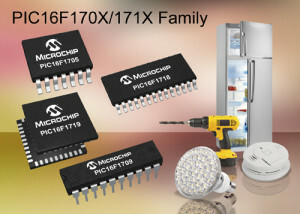 The PIC16F170X/171X are general-purpose MCUs that are ideal for a broad range of applications, such as consumer (home appliances, power tools, electric razors), portable medical (blood-pressure meters, blood-glucose meters, pedometers), LED lighting, battery charging, power supplies and motor control. The PIC16F170X/171X family features Core Independent Peripherals, such as the Configurable Logic Cell (CLC), Complementary Output Generator (COG) and Numerically Controlled Oscillator (NCO). These “self-sustaining” peripherals take 8-bit PIC® MCU performance to a new level, as they are designed to handle tasks with no code or supervision from the CPU to maintain operation. As a result, they simplify the implementation of complex control systems and give designers the flexibility to innovate. The CLC peripheral allows designers to create custom logic and interconnections specific to their application, thereby reducing external components, saving code space and adding functionality. The COG peripheral is a powerful waveform generator that can generate complementary waveforms with fine control of key parameters, such as phase, dead-band, blanking, emergency shut-down states and error-recovery strategies. It provides a cost-effective solution, saving both board space and component cost when driving FETs in half- and full-bridge drivers for control and power-conversion applications, for example. The NCO is a programmable precision linear frequency generator, ranging from <1 Hz to 500 kHz+. It offers a step up in performance, while simplifying designs requiring precise linear frequency control, such as lighting control, tone generators, radio-tuning circuitry and fluorescent ballasts. The new MCUs feature up to 28 KB of self-read/write Flash program memory, up to 2 KB of RAM, a 10-bit ADC, a 5-/8-bit DAC, Capture-Compare PWM modules, stand-alone 10-bit PWM modules and high-speed comparators (60 ns typical response), along with EUSART, I2C™ and SPI interface peripherals. They also feature XLP technology for typical active and sleep currents of just 35 µA/MHz and 30 nA, respectively, helping to extend battery life and reduce standby current consumption. The PIC16F170X/171X family is supported by Microchip’s standard suite of world-class development tools, including the PICkit™ 3 (part # PG164130, $44.95), MPLAB® ICD 3 (part # DV164035, $189.99), PICkit 3 Low Pin Count Demo Board (part # DM164130-9, $25.99), PICDEM™ Lab Development Kit (part # DM163045, $134.99) and PICDEM 2 Plus (part # DM163022-1, $99.99). The MPLAB Code Configurator is a free tool that generates seamless, easy-to-understand C code that is inserted into your project. It currently supports the PIC16F1704/08, and is expected to support the PIC16F1713/16 in April, along with all remaining MCUs in this family soon thereafter.